OXFORD, England – Greece’s Catholic Church faces disaster because the current economic crisis is forcing it to end vital social and charitable projects, said Archbishop Nikolaos Foskolos of Athens. “We’re only a small minority, with few properties and resources, and we’ve been burdened in recent years by many Catholics coming here from poor countries in search of a better life, using Greece as Europe’s eastern gateway,” Archbishop Foskolos said. The EU and International Monetary Fund agreed to provide $156 billion in emergency loans to help Greece pay off some of its $485 billion debt by the end of 2014. In addition to spending cuts, the economic plan passed by the Greek Parliament calls for tax increases, a “solidarity levy” on households, sweeping privatization, school closures and sharp state sector staff and wage reductions. Archbishop Foskolos said the crisis has forced Caritas Greece, the church’s aid and development agency, and the Sisters of Charity to reduce assistance to refugees and asylum seekers. The Catholic-run hospice and two soup kitchens in Athens also planned to close by the end of 2011 because they did not have the resources to keep them running. 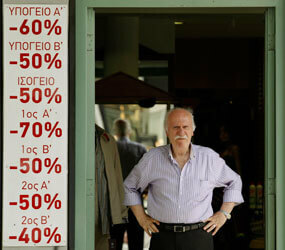 “Many people are suffering real poverty in Greece. Though we are doing what we can, the situation can’t continue,” said the archbishop, who oversees a church numbering 200,000 Greek and foreign members in four dioceses.